As my mind turns to flying to Vietnam tomorrow, with 50 students, on a CAS trip, I started to think about performance in that beautiful country. Many months ago I wrote about the traditional Water Puppet theatre for which Vietnam is very famous. I don’t imagine there is a visitor who has ever been to Hanoi who has not been to the Thang Long Water Puppet Theate to see a performance – I will be there again tomorrow night. However, there is another theatre form that is very popular in Vietnam and that is Cai Luong, which roughly translated means renovated or reformed theatre. The Water Puppet theatre has its roots firmly in Vietnamese rice farming culture, but Cai Luong is an interesting mixture of East and West theatrical traditions, having being heavily influenced by the French during their rule in Vietnam. 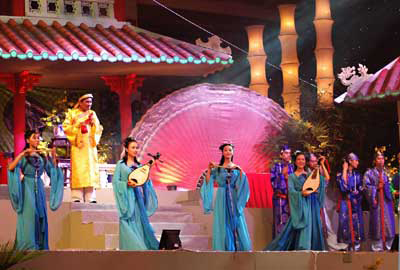 Essentially, Cai Luong is the convergence of southern Vietnamese folk songs, classical music, tuong (a Chinese-based classical theatre form) and modern spoken drama, all coming together to create folk opera. Also on this site are pages about two other, more traditional, Vietnamese Opera forms, Tuong and Cheo that are more ‘Classical’ in their nature (and more serious in their themes and content). Cai Luong has a reputation for being lighter and more comic. Perhaps what is most astonishing of all is that unlike many traditional theatre forms across Asia, Cai Luong is thriving, growing in popularity and although some of this growth is driven by tourism, it has huge appeal to the Vietnamese too. There are even some instances of the traditional dress and costume being swapped for more contemporary clothing. A national newspaper in the UK has just launched a project that really interests me – the idea of a crowd-sourced theatre project. The Guardian is working with a regional theatre, The West Yorkshire Playhouse, on a production of Tennessee Williams’ Cat on a Hot Tin Roof. 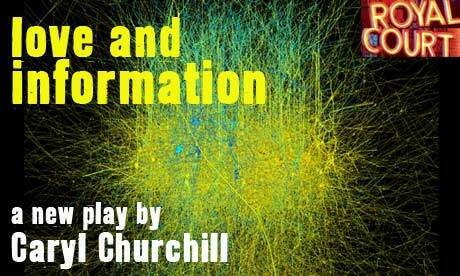 During the production they are running a series of articles that take you through the production process as well as exploring in more depth other aspects of staging the play. But more than this they asking their readers to review the show and share their reviews, as well as offering advice from professional theatre critics about how to write a good review. The link that will take you to the ‘series’ page is here. You can even watch trumpet player Simon Beddoe and pianist Matthew Bourne talk about the challenge of providing ‘reactive and emotive’ improvised accompaniment to the play, working with the cast and the director to create a soundscape that reflects and comments on the world of the play by clicking here. However, my favorite so far is an article by Alfred Hickling, which follow the fit-up week when the set is built and technical rehearsals take place. It’s that interesting I’m not going to link to it, but reproduce it in full. It’s the first day of the fit-up at the West Yorkshire Playhouse – the week in which the set is installed and technical rehearsals begin – and already production manager Eddie de Pledge has a sinking feeling. 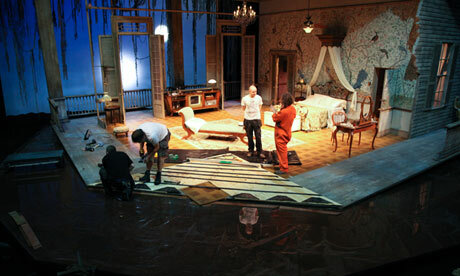 Not that there’s anything wrong (the build is progressing on schedule), but the design for Cat on a Hot Tin Roof requires approximately a third of the stage to be submerged in brown, bourbon-coloured water. Movement director Etta Murfitt has been teaching Boxer how a much larger person gets in and out of a chair; and has spent time developing a suitably feline stance for Zoe Boyle, who plays Maggie the Cat. 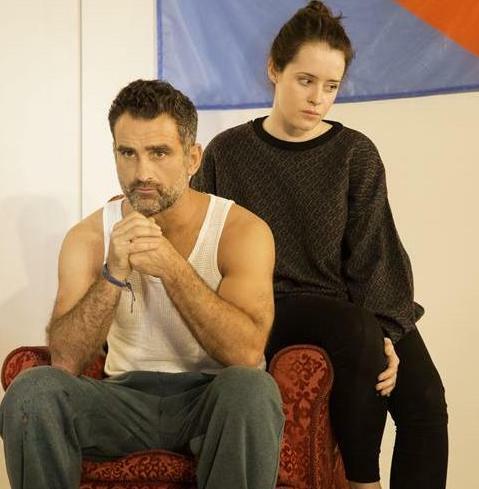 But there is little point in the actors looking right if they don’t sound right; and perhaps the most indispensable role has been that of voice specialist, Kara Tsiaperas, who has coached the cast in the nuances of deep south dialect. Today I am reproducing an article that appeared this week in the UK Guardian. 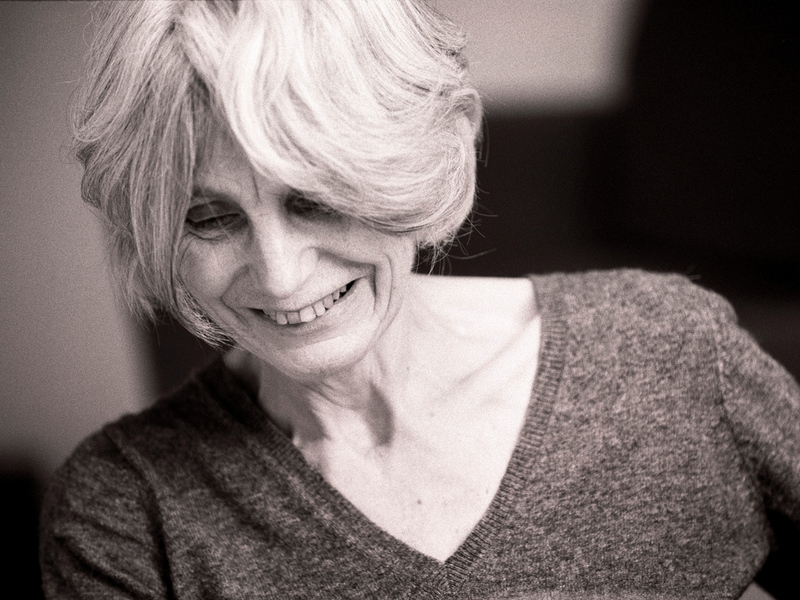 In it, Mark Lawson speaks to people who have worked with playwright Caryl Churchill over the course of her prolific career. At the beginning of September I wrote about Churchill in a post called On Cloud Nine which is essentially about her incredible theatrical legacy. One of the things that makes Churchill even more fascinating is that she never speaks publically about her work, hence this article talking to those who have worked with her over the years. Since the death of JD Salinger, one of my biggest regrets as an interviewer is that Caryl Churchill declines to speak publicly about her work. It’s a resolution she has stuck to through the quarter century in which she has established herself as one of theatre’s most innovative and provocative dramatists. Tantalisingly, there have now been two new plays within a month that journalists can’t ask her about: today, the Royal Court in London premieres Ding Dong the Wicked, a half-hour drama that will run alongside Love and Information, the enthusiastically reviewed full-length play that opened there three weeks ago. This is still the case, says Dominic Cooke, artistic director of the Royal Court. “The plays aren’t usually formally commissioned. So, in that sense, they just turn up on my desk. 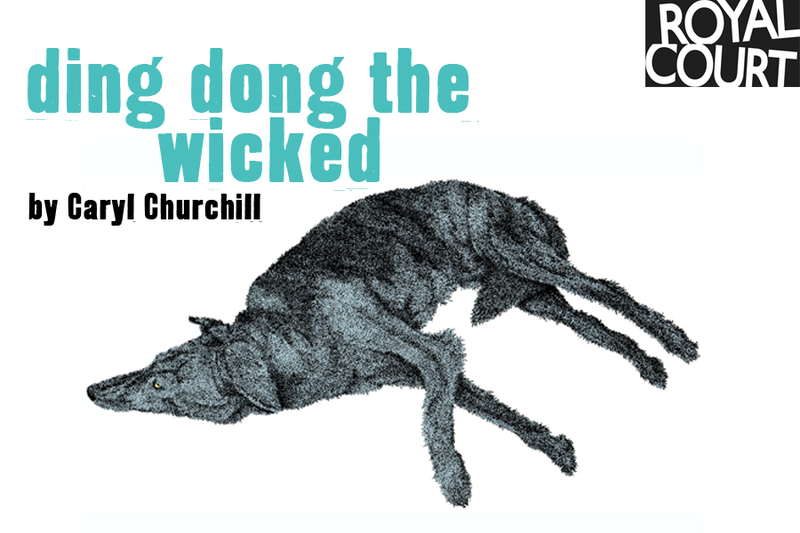 I have no idea what I’m getting.” The late addition to this autumn’s repertoire of Ding Dong the Wicked marks the second time the author has turned up at rehearsal with a second new play. The actor Allan Corduner was rehearsing Ice-Cream at the Royal Court in 1989 when, he says, “Caryl came in and said: ‘I’ve just written another new play. Are you up for it?” Called Hot Fudge, an allusion to the other play, Corduner recalls that this unexpected extra was “rehearsed and staged in record time”. Tydeman hints at a private stability that underlies this quiet certainty. “One of the things that always strikes me about her is that I think she’s the only person in my address book who is still living at the same house she was living in in the early 1960s.” He has never met Churchill’s husband, David Harter, a campaigning solicitor, but she would often refer, during their working years, to her three sons and “writing the plays at the kitchen table”. A short post from me today, and one for Hong Kongers really. If you click on the image above it will take you to a new website, HKLED that lists (and reviews) all the English language drama in Hong Kong. You can sign up to receive a weekly newsletter about what’s on. Check it out and see what’s about. This is an image taken on 16th September of British theatre producer, David Cecil. 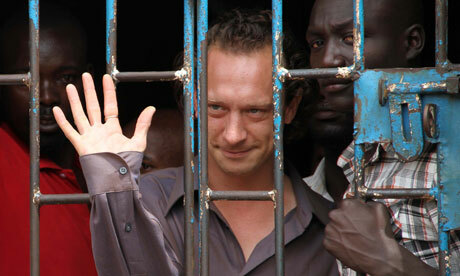 He was appearing in court in Kampala, Uganda, after having been arrested. What had Cecil done? Well, he dared to stage a play about homosexuality in a country that is currently debating a law that could possibly make being openly gay, punishable by death. Currently you can be imprisoned for life in Uganda for being gay. Cecil was, in fact, released on bail, pending another court appearance in mid-October that could see him put behind bars for 2 years. His actual crime was to stage the play, The River and The Mountain, by playwright Beau Hopkins, without gaining authorisation from the Ugandan’s Media Council. The National Theatre of Uganda refused to stage play because some government officials objected to it. The play tells the story of a corporate businessman coming to terms with his sexual identity in a climate of oppressive homophobia. The protagonist, Samson, is a good man and a gay one. When his mother learns of his homosexuality, she tries to cure it by hiring a pastor, a private dancer and finally a witch doctor. The play ends with his murder at the hands of his co-workers. If click the image above, which is taken from the play, you can read an interview with Okuyo Joel Atiku Prynce who played the lead role of Samson in The River and the Mountain. Theatre has played a significant role in the last 50 years in bringing about the legalisation of homosexuality right across the world. Only yesterday in The Observer, British theatre critic Michael Billington wrote a lengthy piece about Tennessee Williams’ Cat on a Hot Tin Roof entitled Tennessee Williams’s southern discomfort. For those of you who don’t know the play, it deals in part with the suppressed homosexuality of one of the lead characters, Brick. I have nothing but the utmost respect for people like David Cecil and the cast of The River and The Mountain who dare to challenge what they belive to be morally unacceptable. Only last year a gay rights activist in Uganda, David Kato, was brutally murdered after a tabloid news paper printed details about his private life. Theatre has a long history of inciting fear in governments and other powerful people, that results in banning – look back as far as Molière and even farther. Molière, a French actor and playwright, wrote Tartuffe in 1664 and that was banned after being performed at Versailles for attacking and exposing the hypocrisy and deceit of the upper classes. People were afraid it would affect change, and wham, it was gone. And as you look through the history of theatre, you begin to realize that a playwright wasn’t tackling enough daring subject matter if they hadn’t been banned in some theatre somewhere. Theatre-goers have historically been a riotous bunch, so you can see where the fear would come from. A modern audience member really recognizes the power of work on the stage to change the course of politics and daily life off the stage. Playwrights like Bertolt Brecht based their entire body of work off that power. Plays like The Laramie Project (about the murder of Matthew Shephard, a show that brought the discussion of hate crimes and trials to a nation) were written to directly engage with politics and to change the mindset of the culture around them, to explore territory that had not yet been explored. The story of David Cecil and The River and The Mountain is not over yet.